Did you ever wonder why children in America pledged allegiance to the American flag? The story actually begins in Boston. 1892 was the four-hundredth anniversary of Columbus’s discovery of the New World. That year, two Bostonians embarked on a mission to use their paper and the event as an opportunity to put flags in schoolhouses across the country. A Boston businessman by the name of James Upham owned the magazine Youth’ s Companion, which featured serials and other stories for youngsters and families. At the time, it commanded a circulation of 500,000. In 1891, Upham began using the magazine to sell American flags to schools. It worked. By the end of that year, the magazine had sold 25,000 flags. During the same year, he also petitioned the governing board of the Columbian Exposition for a day to celebrate the founding in schools. The board agreed that it would be a good idea, provided the federal government would approve it. Upham then went to Washington to petition Congress and the President. The system of universal education is in our age the most prominent and salutary feature of the spirit of enlightenment, and it is peculiarly appropriate that the schools be made by the people the center of the day's demonstration. Let the national flag float over every schoolhouse in the country and the exercises be such as shall impress upon our youth the patriotic duties of American citizenship. I pledge allegiance to the Flag of the United States, and to the Republic for which it stands, one nation, indivisible, with liberty and justice for all. In 1939, as war raged in Europe and images began to appear of the Hitler salute, the Sons of the American Revolution began pressuring Congress to adopt an official set of flag rules and etiquette for ceremonies. 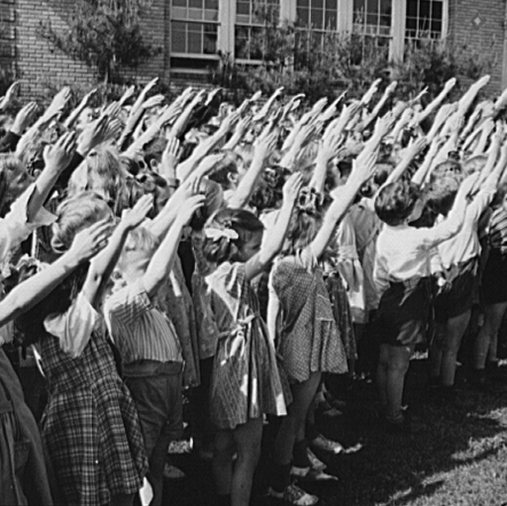 Outraged by the schools’ compulsory flag salute and pledge recitation some began to challenge its legality. As a result, the Supreme Court struck down compulsory pledge recitation during the school day in Minersville School District v. Gobitis (1940). In the wake of Pearl Harbor and American nationalism, Congress responded to public pressure by passing the Flag Code in 1942, changing the salute to a hand over the heart. As far as flags in the schools were concerned, the Flag Code only mandated the display of the American flag during the school day. While the Pledge was no longer mandatory, many schools continued to start the day with an optional recitation, keeping in line with an already well-established tradition. In addition, after Pearl Harbor everyone was proud to pledge allegiance to their flag. when did"under God" get added to the Pledge? Yep, I knew I forgot something! Eisenhower, after being petitioned by the Sons of the American Revolution, added it in 1954 to separate the US from the Godless Soviets. good job guys.. i enjoyed reading it. Good post! Of course, this was at the same time and place that Frederick Jackson Turner closed our frontier. 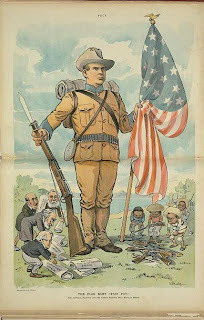 I understand, too, that the patriotism so flagging (excuse the pun), which the "Pledge" was to address, had a resounding comeback with the opening of the Spanish American War, but that's another topic for another day!